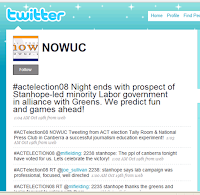 Julie Posetti, lecturer in journalism at the University of Canberra, led a group of journalism students in a gig to report on the ACT election on 18 October 2008. Apparently this technique has been used for reporting on fashion shows and the like, but to receive election updates from people in my local community was definitely something different. I was sceptical at first, as I have not found twitter to be particularly useful until now. So, while sitting in the lounge room watching the SBS doco on Bob Dylan, I was able to get up-to-the-minute reports and keep track of the election on the laptop without changing channels. I still think that twitter has some severe limitations, but, like most applications, it really depends on how connected your friends and community are with the particular application. The local imperative is often overlooked, but it is becoming increasingly obvious that particular local conditions determine the success of particular applications and means of communication. I am using the term 'varieties of particularism' (borrowed from moral philosophy) to describe this phenomenon. While the nomenclature of older debates such as 'centralisation versus decentralisation' and 'regionalism versus nationalism (in a geographic sense)' still hold true geographically, advances in communication have certainly created dimensions which are no longer limited to geography alone. Certainly, earlier media technologies achieved a similar effect, but talking on the telephone and watching television at the same time is far from convenient.